Late last year, Ford tweaked the software of its diesel Super Duty pickup to claim horsepower/torque bragging rights among the Nimitz-class carriers of the pickup world — heavy duty trucks. GM's just launched an internet mule-kick on behalf of its Silverado HD. The company hired automotive testing and verification company AMCI — the ones that make sure automakers aren't engaging in false advertising — to run a series of "real world" acceleration, passing, and braking tests that they've spun into an online video series hosted by Howie Long. 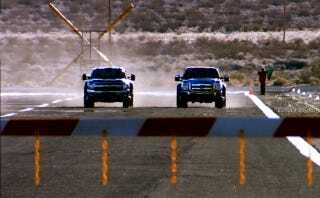 One eye-opening result, with a 1,500-pound load, the Silverado 2500HD got from 0-60 in 7.66 seconds (compared with the F-250 Super Duty's 8.36 seconds), which is a tenth of a second slower than a 1989 Porsche 944. You've come a long way, trucky.